I'm not quite sure there's ANYONE at ESPN who has a trustworthy opinion on any subject, unless they sourced their information from Jay Glazer. Regardless, this counts as a perfect little piece of idle speculation to take and spin in a zillion different directions, so let's do that right now! First of all, Weinstein doesn't say what exactly the Skins would be giving up in order to get such a package. It could perhaps be as little as nothing, given that the Colts may see fit to release both Manning and Saturday by March. 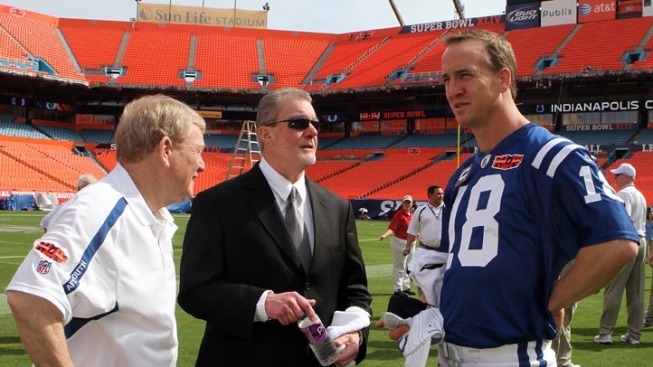 Manning is due a $28 million bonus in March that Colts owner Jim Irsay will surely decline to pay, either by releasing Manning outright or by renegotiating his deal to give him a favorable cap number (NOTE: There's no guarantee Manning would be amenable to this). Of course, the Skins are always more than happy to deal away picks for aging talent. But for now, let's assume Peyton goes to DC as a free agent. Let's also assume Peyton will be ready to play in 2012, even if that's not a lock as of this very moment. Here is what Peyton would have to work with in DC: a good young back in Roy Helu, a decent (but recently suspended) tight end in Fred Davis, an aging wideout in Santana Moss, an average target in Jabar Gaffney, and a potentially good wideout in Leonard Hankerson. That's not exactly a vast improvement over what Peyton had in Indy, unless the Skins were to go hog wild and spring for someone like Dwayne Bowe or Vincent Jackson in free agency to help out (Manning might demand this). You're basically talking about Peyton having to lift up an entire offense all on his own, as he did with the Colts back in 2010. Having Saturday will help, since Saturday would essentially coordinate the Redskins line and help install Peyton's offense. And it would be Peyton's offense. Redskins fans DESPISE current OC Kyle Shanahan, and having Peyton in the fold would allow the team to transfer much of the play-calling duties to Manning while Kyle keeps his dignity. So you'd have Manning working behind a cohesive (but not remarkably talented) O-line, calling the plays, handing off to Helu and throwing to a receiving corps that would be hopefully be bolstered by additional big-name free agents. Would this work? The short answer is yes. The Skins would immediately improve under those circumstances. They could easily go 10-6 with Manning running the ship. The problem is that kind of success will be A) short-lived and B) mild. The Skins aren't winning a Super Bowl with Manning, not with the NFC so loaded at QB (I can't imagine Peyton wanting to leave the AFC for this reason). To get to the Super Bowl, Peyton would have to beat out the likes of Drew Brees, Aaron Rodgers, Matt Stafford, Cam Newton, Mike Vick, and even his own brother. That's not easy for a 36-year-old guy with a bad neck on a new team. The playoffs are the BEST Manning can hope for. And presuming that Manning tails off the way most Hall of Fame QBs do, he'd only have three or four more good years left in him. Are the Skins well run enough to fill out a good roster behind him? I don't think so. I think that Mike Shanahan would be bringing in Manning strictly as a way of maintaining job security. You get Manning, and you buy yourself a couple more years of gainful employment. You go with a rookie, and you get fired after one more season. Manning buys Shanny time, and little else. In an ideal world, the Skins would draft someone like Robert Griffin III and begin a true rebuilding effort. But they may not have the ammo to move up that high in the draft, leaving them stuck with little options at QB, other than risking it all on Manning and hoping he can wing them to a Super Bowl. It's not the best plan in the world, but these are the Skins we're talking about. Nothing they do is well planned.